Microsoft appoints APTEC Distribution as first VAD in Middle East. Dubai - 12th Dec 2010 – Microsoft Gulf announced that it had appointed Aptec Distribution as its first Value-Add Distributor in the region in a move aimed at creating an enhanced and superior level of service for partners and customers in the SMB space on the latest technologies. The move will help Microsoft and Aptec to provide improved value to the specialized and solutions-oriented reseller base. The broad program covers recruitment, training and incentives for the participating reseller base. “I am very proud that Aptec has been appointed as the first Microsoft VAD in the Middle East region. Our confidence in this partnership has led to significant investments in resources and complementary services which will propel the business opportunities for our channel partners and create exciting efficiencies for end users across the region” said Dr. Ali Baghdadi, CEO of Aptec Distribution. 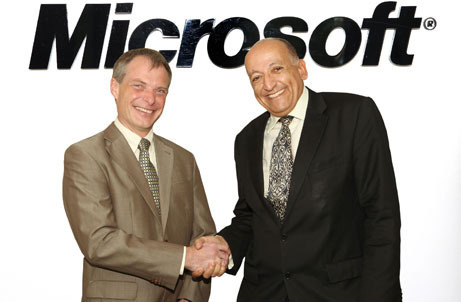 “We are delighted to become the first Microsoft VAD in the Region. We have invested in the necessary infrastructure and we have the skill-set to deliver increasing complex technology to the market and we will work with all partners to develop their skills and specializations in Microsoft technologies.” said Bahaa Salah, Managing Director Aptec Distribution. With its focus on developing a comprehensive partner ecosystem, Microsoft is committed to expanding the business opportunities for its extensive partner base and delivering innovative solutions that help customers optimize efficiency and increase productivity across their organizations.